A protester shot and killed a policeman during demonstrations in Iran, police said on Monday, the first reported fatality among security forces struggling to contain unrest challenging the clerical leadership. Demonstrations continued for a fifth day, after 13 people were reported to have been killed on Sunday in the worst wave of unrest since 2009 when huge crowds took to the streets to condemn the re-election of then-president Mahmoud Ahmadinejad. 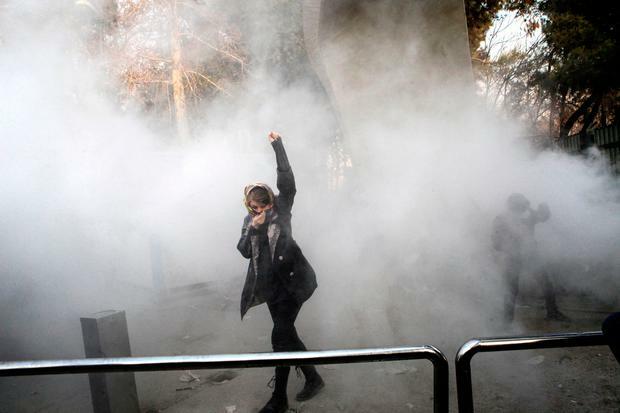 The protests put pressure on the clerical leaders in power since the 1979 Islamic Revolution, as well as President Hassan Rouhani who made a televised call for calm on Sunday, saying Iranians had the right to criticise but must not cause unrest. The killing of the police officer happened when a demonstrator opened fire with a hunting rifle in the central city of Najafabad, police spokesman Saeed Montazer al-Mahdi was quoted as saying by state TV. Three policemen were wounded. It was not clear when the incident took place. State TV said armed demonstrators on Sunday had tried to seize police and military bases but were stopped by "strong resistance from security forces." It gave no further details and there was no independent confirmation. Ten people were reported killed in protests on Sunday, a death toll that rose on Monday when the deputy governor of the western Hamadan Province, Saeed Shahrokhi, told ISNA another three protesters were killed on Sunday in the city of Tuyserkan. Hundreds of people have been arrested, according to officials and social media. Online video showed police in the capital Tehran firing water cannon to disperse demonstrators, in footage said to have been filmed on Sunday. Video posted on social media showed crowds of people, some chanting "Death to the dictator! ", walking through the streets. Reuters was not immediately able to verify the footage. The Fars news agency reported "scattered groups" of protesters in Tehran on Monday and said a ringleader had been arrested. "The government will show no tolerance for those who damage public property, violate public order and create unrest in society," Rouhani said in his address on Sunday. Iran is a major OPEC oil producer and regional power but frustrations have grown at home - where youth unemployment reached 28.8 percent last year - while the country is deeply involved in Syria and Iraq as part of a battle for influence with rival Saudi Arabia. Among the reports of fatalities, two people were shot dead in the southwestern town of Izeh on Sunday and several others were injured, ILNA news agency quoted a member of parliament as saying. "I do not know whether yesterday's shooting was done by rally participants or the police and this issue is being investigated," Hedayatollah Khademi was quoted as saying. Almost nine years since the "Green movement" reformist protests were crushed by the state, Iran's adversaries voiced their support for the resurgence of anti-government sentiment. U.S. President Donald Trump tweeted: "The great Iranian people have been repressed for many years. They are hungry for food & for freedom. Along with human rights, the wealth of Iran is being looted. TIME FOR CHANGE!" German Foreign Minister Sigmar Gabriel urged "all sides (to) refrain from violent actions".